Our honeymoon has been indescribably epic. 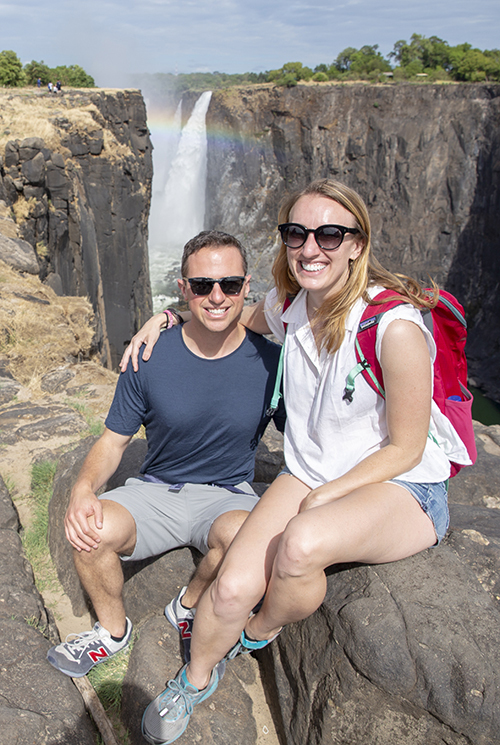 It only stands to reason then, that we’d end our trip at one of the most epic waterfalls in the world: Victoria Falls. 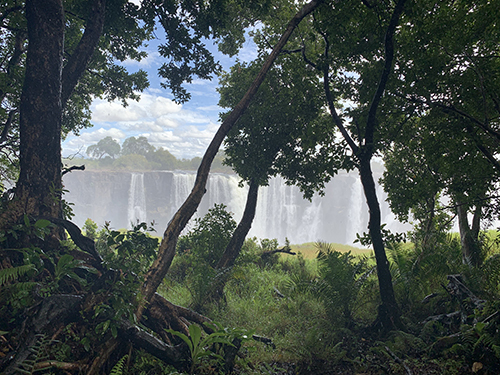 We see the falls from the Zimbabwe side, switching cars three times each way as we’re escorted over the border. We emerge soaking wet from the spray, laughing and amazed at the mini-rainforest that the constant fall of water has created. We say goodbye to the falls, happy to end our trip on such a high, only to learn that it was about to get even better. 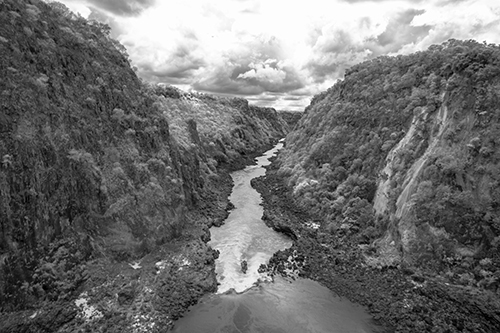 Our travel agent has booked us a surprise viewing of the falls… by helicopter! Our honeymoon was the trip of a lifetime and the coolest thing we’d ever done. We’re so grateful for this experience and cannot wait to return, hopefully next time with a family to share it with. In Botswana, the small population is supported by a government that has done well using diamond profits to provide free education and healthcare to all 2.2M citizens. Zambian people have not had the same luck. 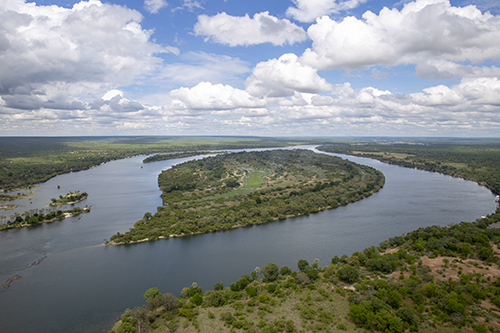 Livingstone is known as the tourist town, and is largely supported by the tourism industry. Our hotel in particular, has been created largely to support the local villages. 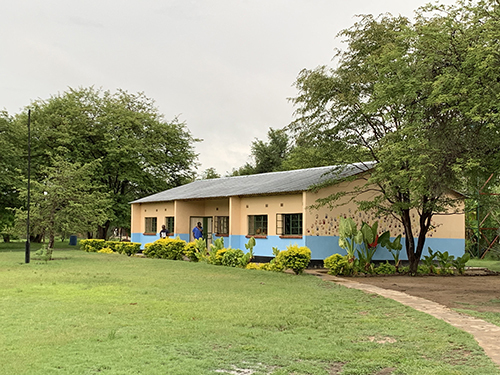 Profits have been used to build a school that grows by a grade level each year. Children age 3-8 walk up to 3k every morning to attend, believing strongly that education is their way out of poverty. In the coming years, the hotel hopes to pay the bill for any student who wants to continue their education into high school or college. The hotel also supports the local villages by hiring locally. The boat driver at the hotel shows us his home in the village and introduces us to his wife and family. His salary, he tells us, supports 30 members of the village. It had also been enough to pay the lobola (dowry) for his wife – a common practice in Southern Africa where the eldest uncle determines how many cows his niece is worth. 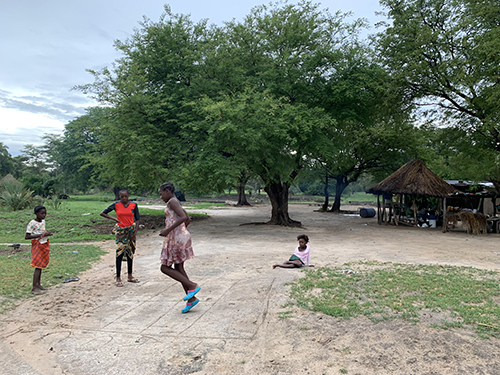 After hearing about the poverty in Zambia and visiting craft markets where people asked to trade goods for our used socks, it felt like one of the few true solutions to a more systemic problem: education and opportunity. 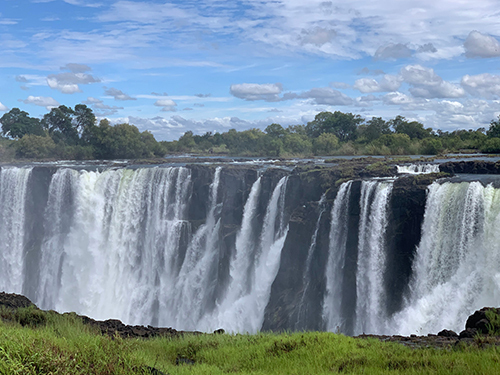 When we tell our guide that there are almost no bugs in San Francisco he says, “Wow… What happened?” The people of Botswana and Zambia, we come to find, have a necessarily different relationship with bugs. When we arrive at the Island of Siankaba, we’re told there are very few bugs, but shine a light on anything that you’re eating at night, and you’ll surely find a few small friends that have taken a liking to the dish as well. (Best to not shine the light.) In the bush, we ate more bugs than we likely would in a year at home, but that’s the bush for you. Now we’re in a 5-star hotel in Zambia, close to Livingstone, so I’m more squeamish when I see two big bugs on our table the first night we arrive. 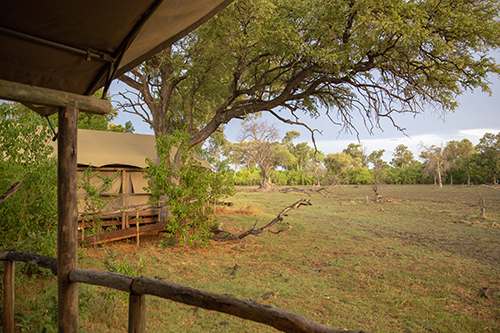 We skip the cheese plate to rush back to our room – I’m anxious for the sanctuary of our tent. 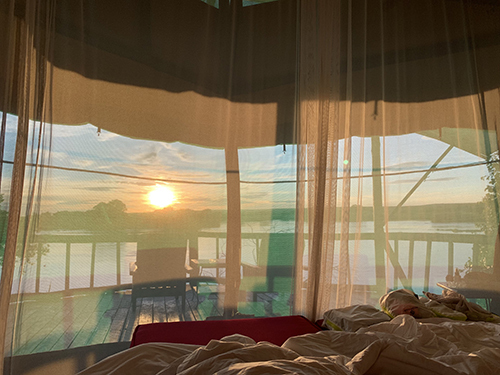 The tent is a gorgeous room set high on stilts, making it feel like we’re staying in a treehouse. 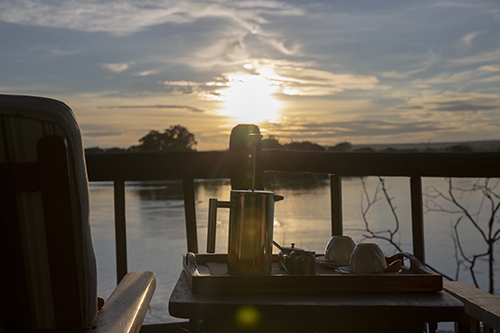 Each of the six rooms overlooks the Zambezi river, a quiet haven along the waterway that leads to Victoria Falls. The rooms are connected by raised walkways and bridges that swing as you walk, and as we’re on a literal island, a boat or mokoro must be taken to the mainland. I’m skittish when we arrive back to our room that night, and we’re careful to close the door quickly to avoid more bugs inside. We turn on the light and I scream. “Really, hun?” But then he sees it too. There’s a bird in our room, flying fast and aimlessly. Andrew runs for help as I duck and cover in the bathroom, unfortunately open at the top to the main space. It had apparently escaped by the time the staff came to catch him, but still I was grateful for the mosquito net keeping me safe. The next day I tell another guest about the bird. He’s from Zambia and his brother works at the hotel, so I assume he’ll find the story funny and not scary. “We had a bird in our room last night!” “Wow, a bird and a bat? !” “No, just a bird,” I say. “Oh, I heard you had a bat.” “A bat?” I look at Andrew. He’d struck a deal with the staff to not tell me it was bat migration season due to my newfound phobia. On our last night in this resort, there’s another. But this time I know what it is, this time it meets me in the bathroom and this time Andrew chases it out of the room himself. My husband has become quite a man of the bush. First thing, the tracks are now stale, but luckily there was a light rain over night wiping clean our etch-a-sketch of earth. The temperature is still cool at 5:45am in the morning, and as we close in on the location of the tracks, we find fresh ones pointing due east in the direction of the rising sun. We cut the engine and listen and wait and listen some more. Birds are just waking up, the wind rustles through the leaves, the hippo laughs at a corny joke just beside the river. Then we hear it, an alarm call. Many of the birds sound an alarm upon spotting a predator, but one that we’ve become attuned to is that of the Starling. We scan the branches looking for the culprit of the sound. We find the bird and strain our eyes to see where it’s looking. We test the boundaries of the vehicle hoping not to get stuck and drive around looking in branches and under trees for the amazingly camouflaged feline. Although the truck sounds like thunder, we keep our voices to a whisper. Our heartbeats are louder than our words as we scan. We circle the patch of bushes once, twice, three times, and cut the engine again to listen. The alarm is gone and so is our leopard. 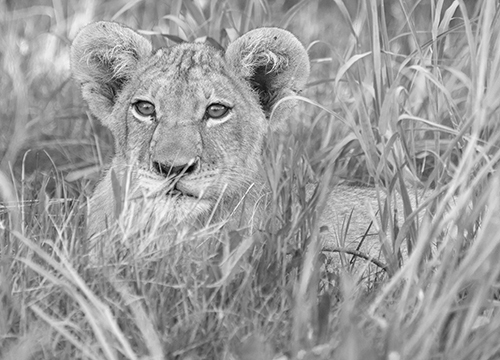 The magic of safari and the adrenaline that follows is that it’s not a zoo. There are no guarantees what we’ll see, when we’ll see, how we’ll see. The only certainty of the day is its uncertainty. And so we continue, and as we go, we rest to enjoy the hippos, impala, giraffes, zebras and elephants. 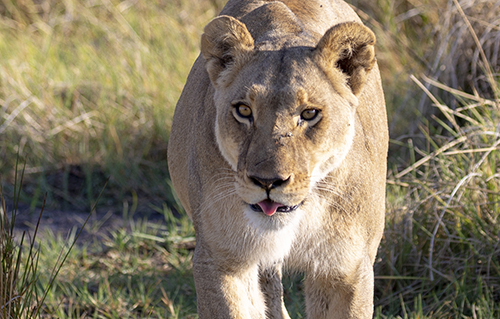 And every so often, we hear what might be an alarm call, stop the car, listen, hunt, and repeat. And every time we do, I’ve got my camera locked and loaded waiting for the perfect moment. After feeling so close for most of the morning, we finally catch our break. The alarming Starling looks deep into the brush, and we try to see what it’s seeing. 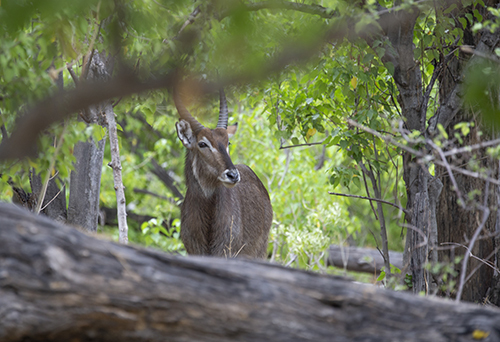 I’d love to take credit, but our guide eyes a spotted tail. We drive around to see if we can get a better look, and eventually we do! 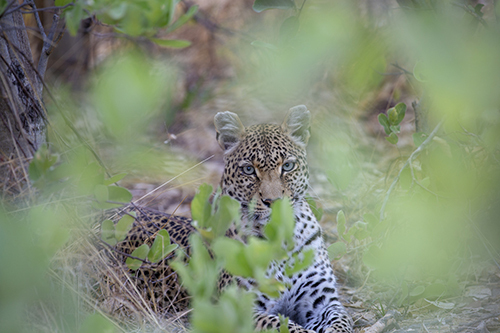 There’s a blue-eyed leopard carefully watching us through the cloak of leaves all around. 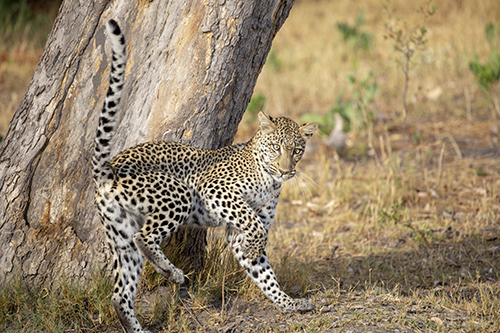 And then, when we’re already satisfied, the leopard starts to move. 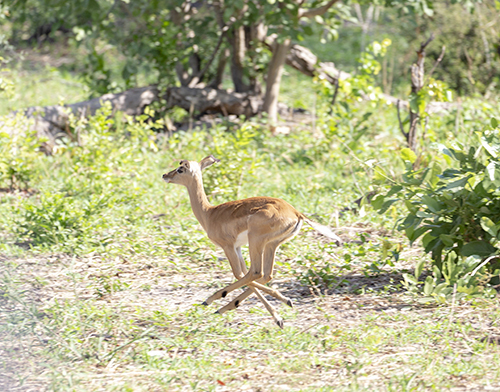 It has spotted a baby impala not too far. It’s steps are so slow, so methodical, so quiet. We wait and don’t even whisper to each other not wanting to disrupt the moment. 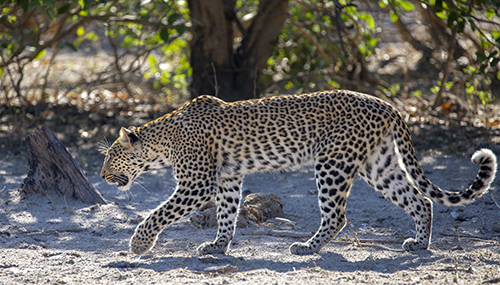 After much maneuvering by both parties, the impala comes within striking distance of the leopard. 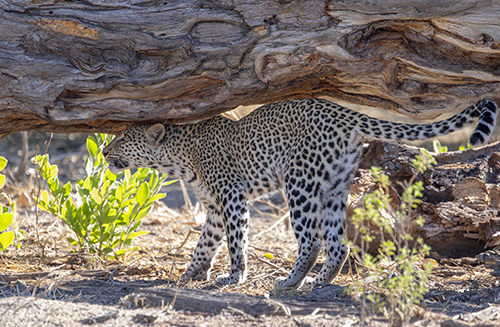 The leopard, also being too young, misses its opportunity, wagging its tail in disappointment. But what a moment. We’d have loved to see more action, but the suspense and beauty of the slow motion chase is still a thrill. Whenever Lindsey or I sneeze, we’d also hint that our cat allergies were giving us another clue, but that one was much less reliable than the tracks and the birds. But whenever a real clue would show itself, we’d become detectives and enjoy every moment of the hunt. Each exotic find equally exciting. 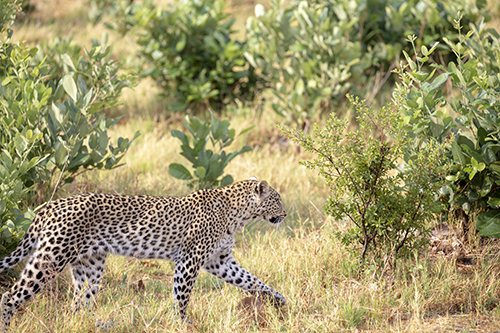 We got to see lions and cubs up close, we came across several leopards, and were even lucky to stumble upon the elusive serval cat. 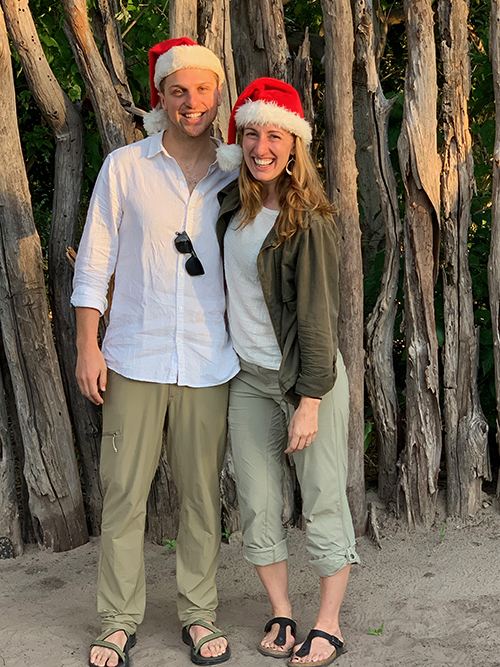 Botswana is a primarily Catholic country, so Christmas is just as important to the staff as it is the guests. The meals are made for celebration and eaten at a special table that accommodates both camps. We’re treated to a wonderful performance of song and dance by the giddy staff, a mashup of styles between the tribes. 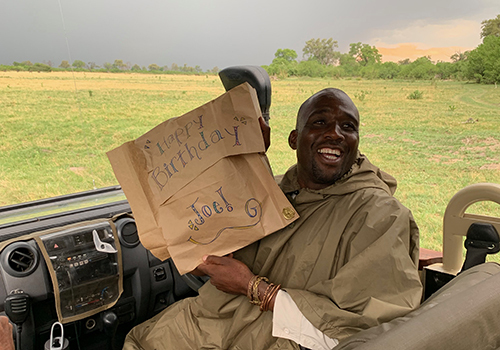 It’s our guide’s birthday, so we spend the afternoon crafting makeshift wrapping paper for a gift we bought from the gift shop. (Temple tipped us off on a hat he’d had his eyes on. It was so fun seeing him open it.) 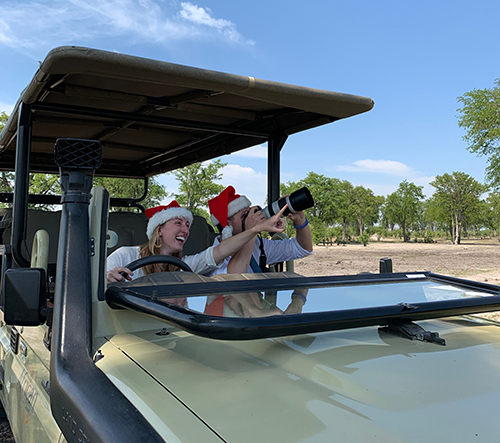 Our night game drive reveals few animals, but an incredible lightning storm filling the sky from all sides in an open plain: Christmas fireworks. 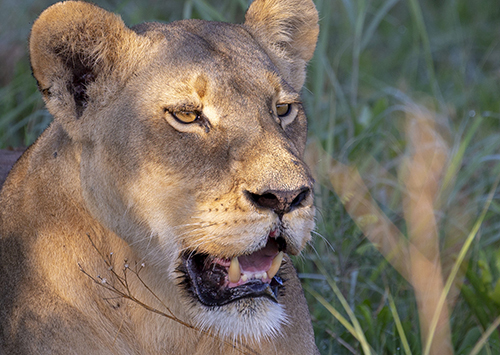 Linyanti is as different to Khwai as Khwai is to the Kalahari. 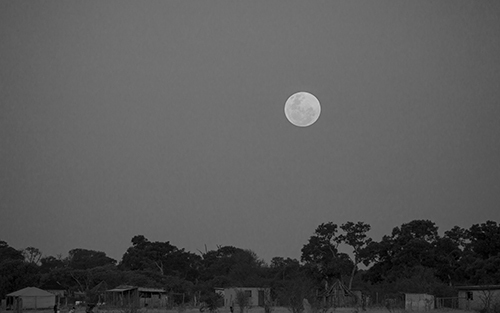 We arrive by plane, but instead of our typical 10-minute drive to camp, we drive an hour deep into the bush. There are only two camps here, each with six tents, and the nearest village is over 2-hours away. 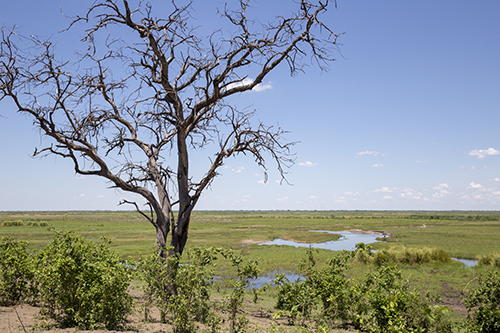 We’re on the edge of the Botswana border; You can see Namibia in the distance. The land is a mix of deep brush and wetlands, and subsequently the first place where we encounter real bugs. 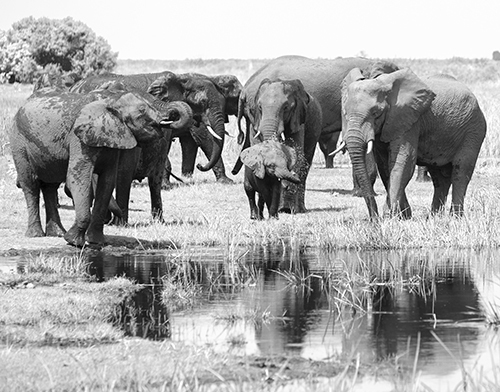 This place makes Moremi feel like a zoo. 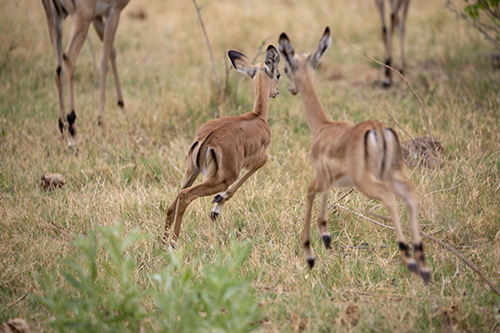 Here, the animals act as they would in nature, scurrying away as soon they’re seen. 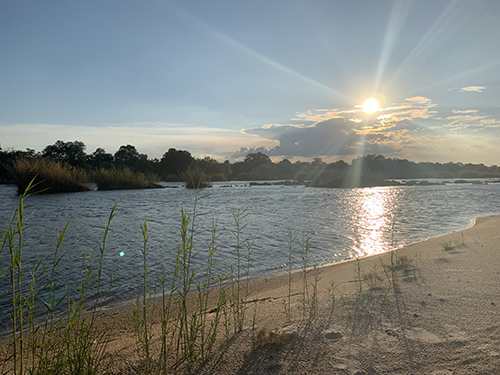 The hippos had a field day when we set up for our sun downers outside their water hole, snorting at us, showing us their teeth, yelling to say that we best be advised not to come any closer. 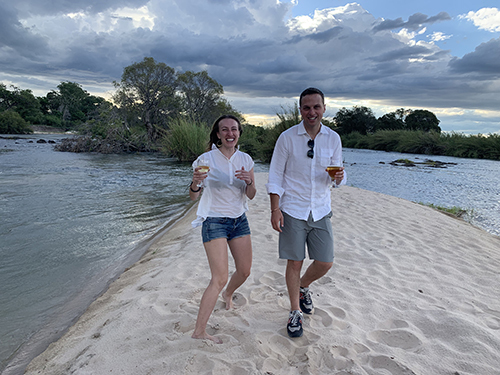 Joe, our guide in this last safari camp, assures Andrew that they’re territorial only about the water, so brings Andrew around for a better view of sunset. 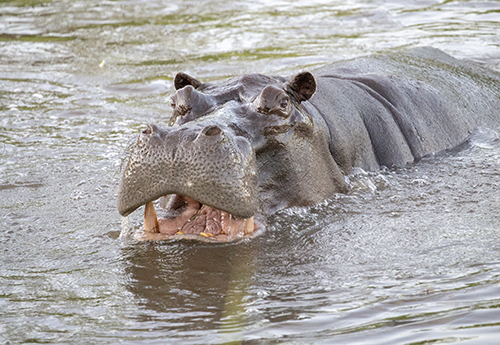 Hippos are the second most dangerous animal in Africa, behind malaria spreading mosquitos, and they continue to show us why as their eyes follow, mouths open, giant bodies emerging. 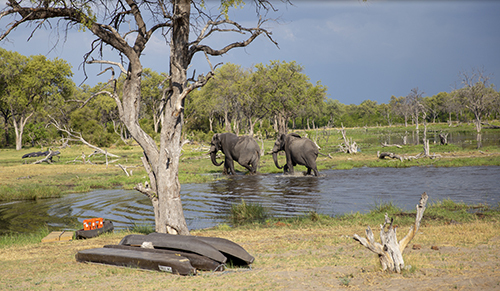 The elephants here appear not in groups of three, but groups of thirty. 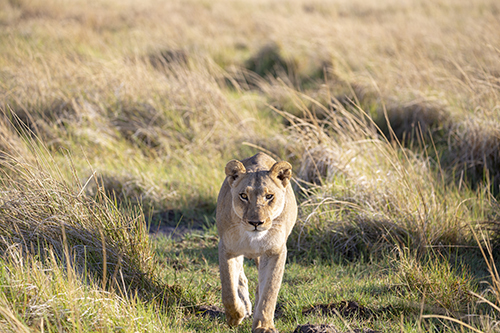 When it’s dry, they walk past the truck in droves, slowly marching their way to the marshland. 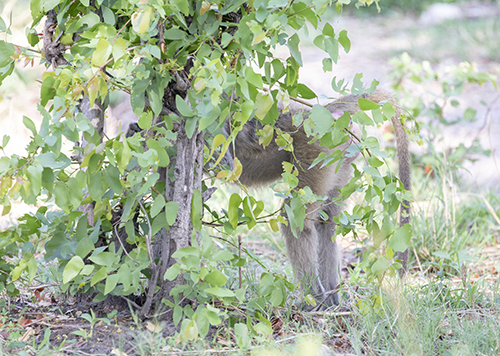 The baboons travel in groups even larger, and hysterically think that if they can’t see you, you can’t see them. They’ll run away from the truck by hiding behind a tree, body in plain sight, slowly peeking glances back at you. 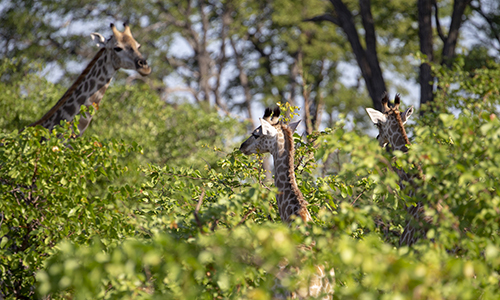 Giraffes are surprisingly difficult to spot, considering their size, but when you do they look straight at you, a contrast to the baboons. We are in the middle of nowhere, no wifi, eaten by bugs and surrounded by wild animals, and yet we’ve never felt safer. 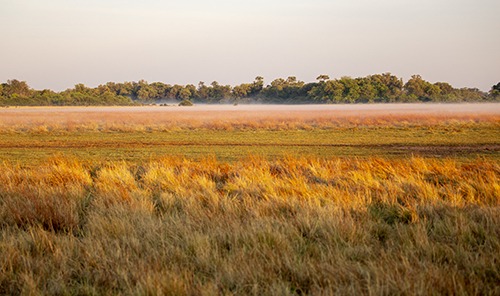 The bush, we decide, is our paradise – a feeling as much as a place. Khwai was off to an adventurous start. Little did we know that our trip here would both begin and end with elephants. But first, the time in-between. 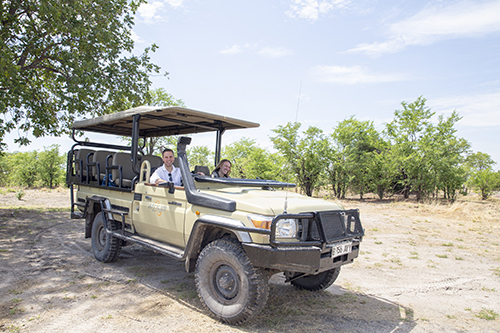 Banda was our fearless guide, leading game drives and always conscious to give Andrew the best lighting. 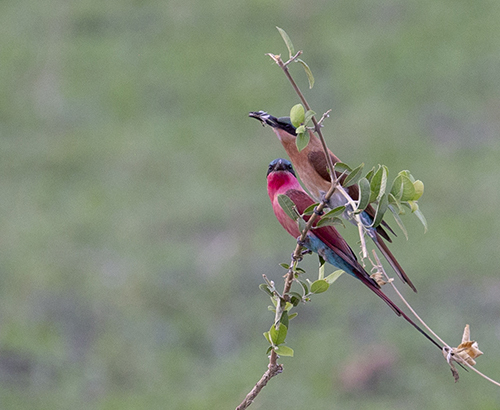 He’s a photographer too, and had captured some unbelievable moments in the bush. When he got wind of a rare animal nearby on the walky talky, he’d speed down the bumpy sand roads so fast it felt like we were riding a bull. We made a game of ducking before the branches whipped our faces. 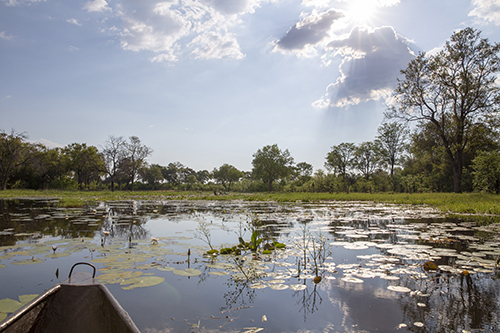 One afternoon we forewent the game drive to take a relaxing trip down the delta on a mokoro. We sank deep into the water on our boat as our guide stood behind, pushing us forward. 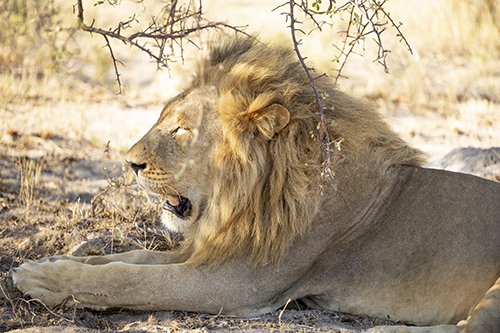 It was a welcome respite from the adrenaline-inducing game drives. When a light rain started to fall, we put our cameras into plastic bags. 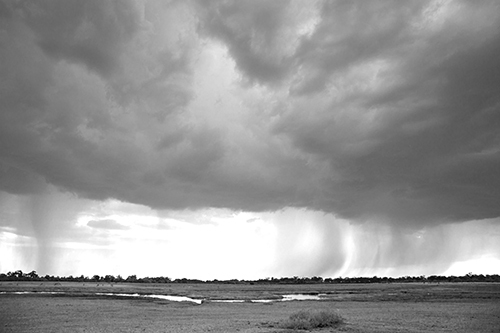 Within 30-seconds, the sky opened and we were drenched, struggling to see through the rain. We were laughing hysterically as our guide tried to continue the ride as thunder roared overhead. 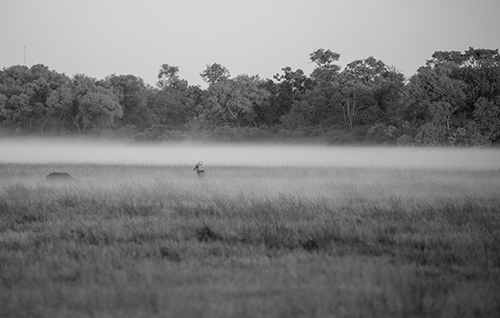 As we were rushing back, Banda was shooing hippos away from heading directly toward us with an extra mokoro boat. 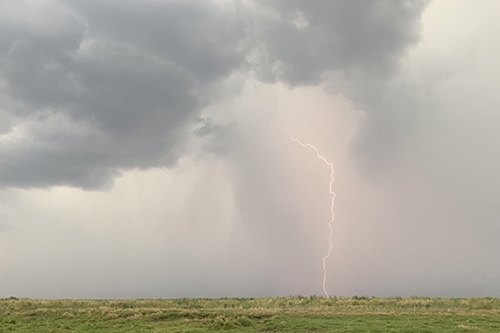 Our guide nearly jumped out of the boat when a final bolt of lightning came down within a mile of us, hitting a nearby car. The rain stopped just long enough for us to have sunset drinks in the park before opening the sky again. On our last night, the staff set the most special lantern lit dinner right outside our camp. We’d made friends with the other adventurers and spent the night laughing and sharing photos. 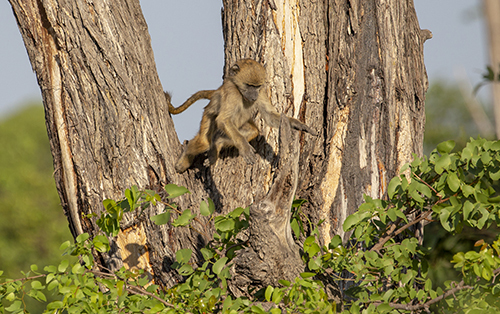 Andrew and I had successfully convinced them we’d seen a leopard kill a monkey using an old video from Banda when we heard something in the bush. We shined a light into the distance to find one giant elephant about 100 yards from us, munching on a tree. He headed toward us, then another one, and later a hippo. 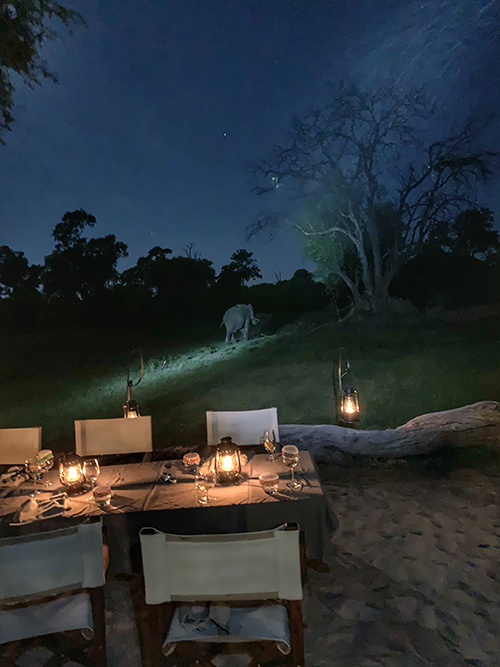 There we were, dining under the stars, sharing the space peacefully with massive animals also trying to get their fill. In our tent that night, you could see the elephant passing by before we went to sleep. 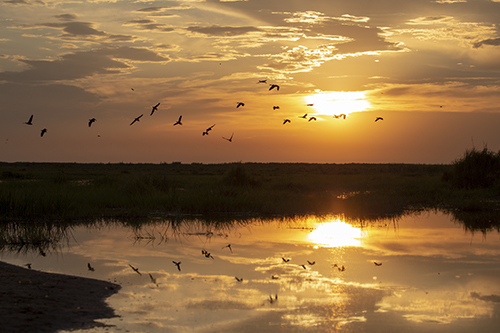 The flight from camp Kalahari to camp Khwai reveals a completely different scene. 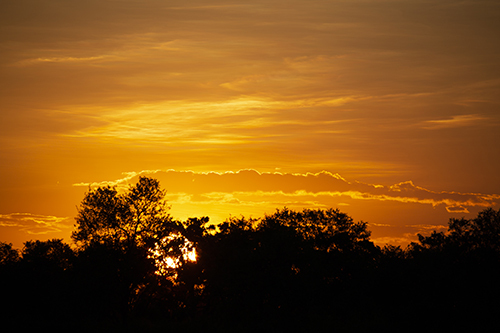 The Kalahari is a desert; the landscape below stark and vast. Everything is a shade of brown. It’s a difficult place for most animals to survive. 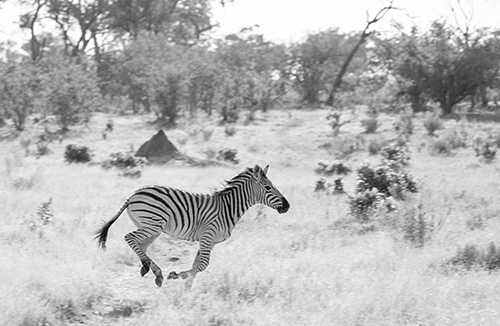 Zebras and wildebeest appear in droves in the wet season, having migrated for greener grass to eat as their more permanent residence regrows. Any other animal is more of a mission to seek out. Guides in the Kalahari have to be even more knowledgeable, treating every sound, every dropping, every track, and every plant as a clue. Khwai, on the other hand, gets plenty of rain. The land is rich with plant life. Here, our guide tells us, branches are the most dangerous thing. 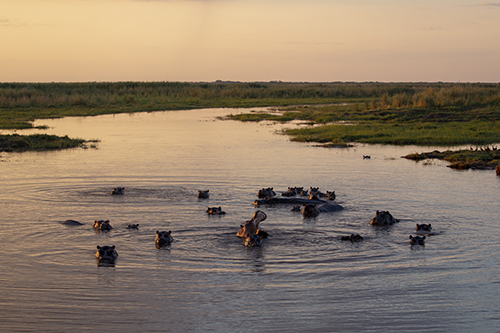 Before we even hit the Moremi park, our destination for the first drive, we see a dozen hippos cooling off in the water. 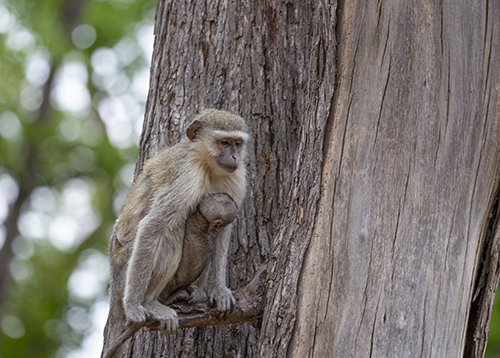 A moment into the park and we see a baboon scurrying up a tree, it’s baby wrapped with all fours around its stomach. 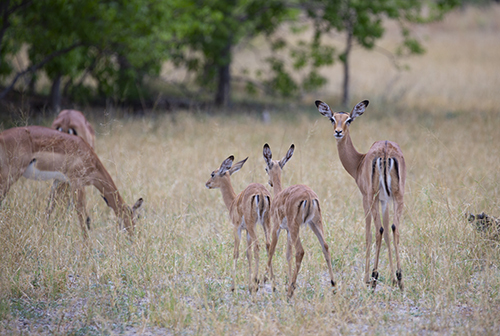 Impalas, antelopes, giraffes, buffalo, waterbuck, zebras, wildebeest, and warthogs are next, many with their young. 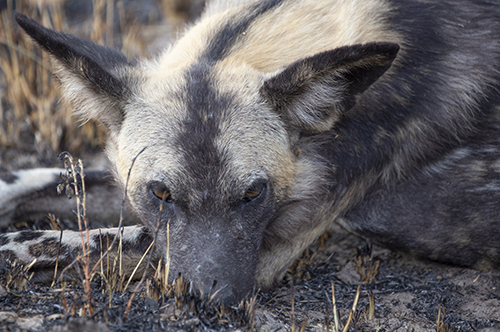 Driving along a burnt patch, we see wild dogs. 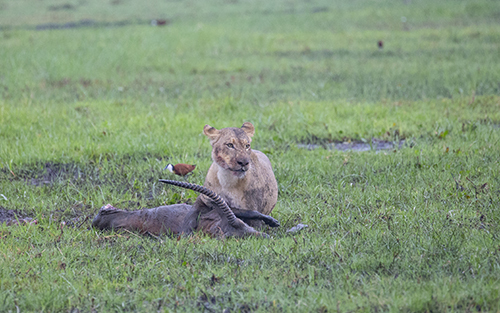 We know this is a great spot when our guide whips out his camera and starts shooting. 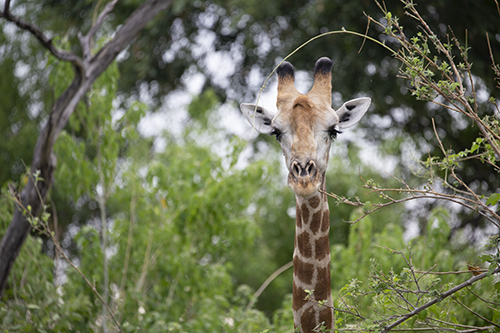 There are only 3,000 left in the world, he tells us, and they’re very rare to see. As we’re leaving, we come across elephants. 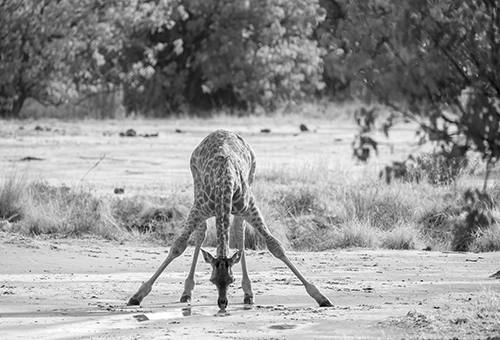 They’re so massive and enchanting; gentle giants at the watering hole. 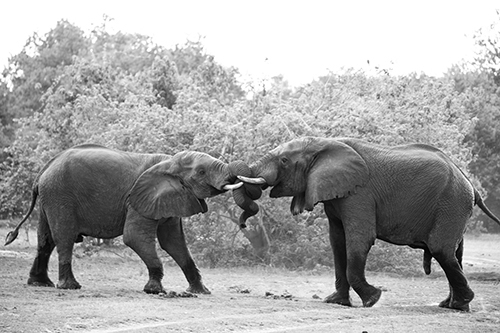 Two male elephants start to play, or so it seems. 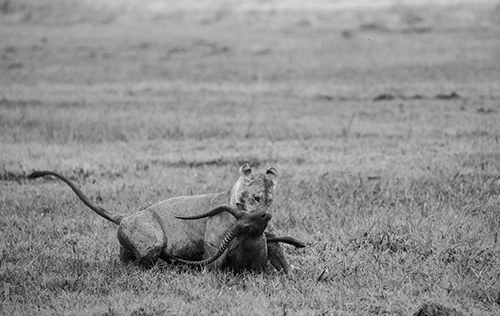 They lock tusks and start rearing each other, yelling, throwing their trunks. It’s an act of dominance, and they push back behind the brush. 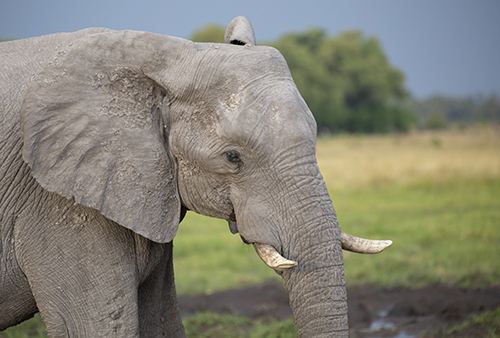 Testosterone is flowing when one elephant reemerges, spotting our truck. He’s not going to let any animal, alive or diesel-fueled, get in his way. 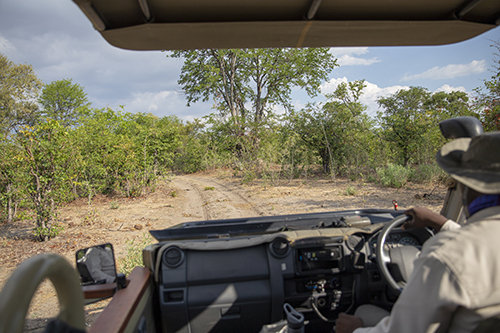 Our driver revs the engine to warn the other elephants to stop moving. If this elephant starts to charge, they’d be directly in our path of escape and we’d be trapped. The elephant roars and mock charges the truck. We stand our ground, it turns, and we drive away unscathed. 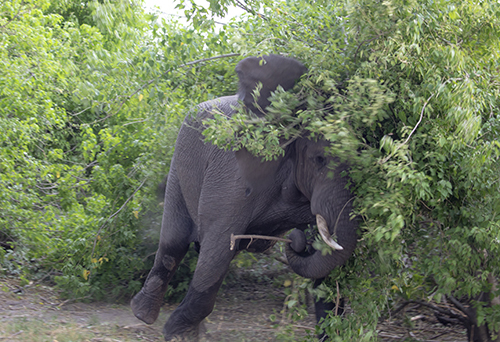 Branches are not the most dangerous thing in Khwai. The bushmen are the indigenous people of Africa. They are hunters and gatherers, wandering the bush and avoiding lions to survive. About 30 years ago, the government mandated that all citizens get an education. The bushmen were given the choice to stay living where they were in the national parks and forgo an education, or move into government subsidized settlements near the schools to participate. They chose the latter and so, everyone under the age of 30 speaks English in addition to their native language. 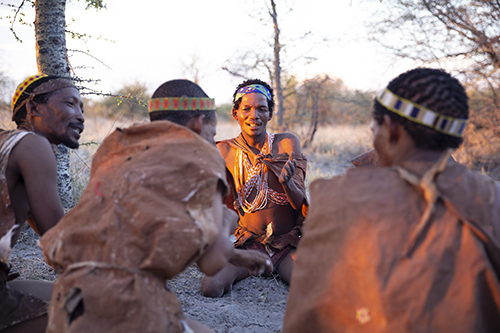 The native language of the bushmen is as varied as their tribes. Literally every tribe, of which there are hundreds, has its own language. All include a variety of clicking sounds, most of which occur mid-word. It’s very difficult to replicate. As the rest of the community are non-English speakers now living in settlements, money has become problematic. Cattle herders is generally the best bet. Alcoholism is a threat. 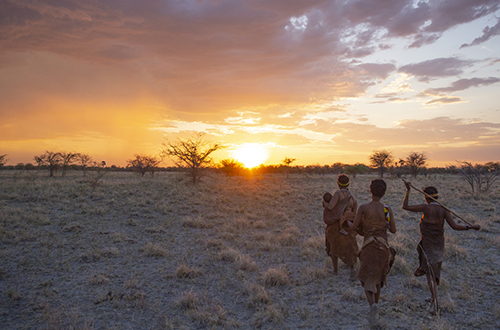 One tribe had the idea of offering walking tours as a way to share their culture with others, and so for three months a year, the bushmen move in to the Kalahari to make extra money. 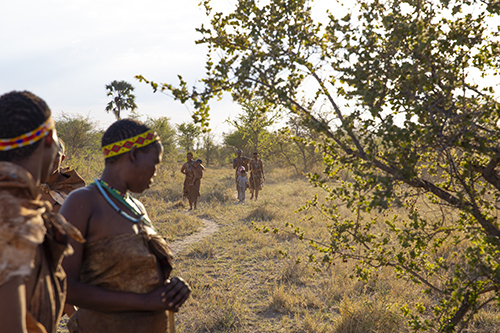 We meet a group of about a dozen bushmen: men, women and children. They show us the plants they use to make poison for their arrows, how to start a fire using zebra dung, and how to dig up scorpions for entertainment value. We end the night watching the men play a game while the women chant a cheer. It’s easy in this moment to be struck by the significant differences between the bushmen and ourselves. The adults are dressed in animal hides, but we must remember that this is a representation of how the Bushmen used to live. When they get back to their temporary settlement, they’ll put on Western clothing, not wanting to overwear their leather as these items are irreplaceable during the hunting ban. 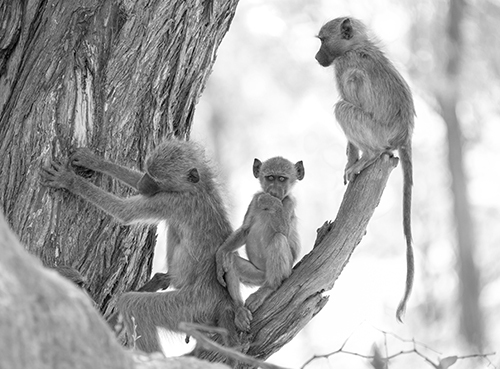 (The only exception to the ban is small game for bushmen only, as hunting is so core to who they are.) Every place has its indigenous population, and these people are often grossly mistreated. 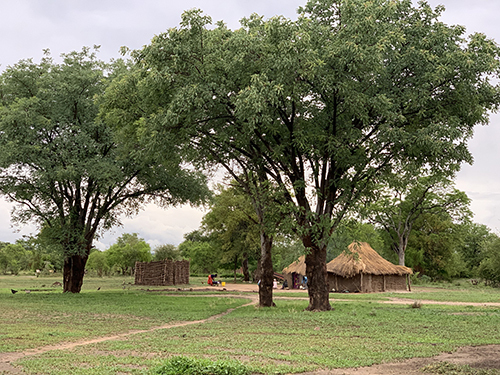 From our Western point of view, it seems that the government and people of Botswana have given the bushmen freedom to own the choices made about their future. The transition though, is new and only time will tell how it all unfolds.